With the cooler rainy weather we’ve had this week in Kansas, you know my thoughts once again turned to soup. Regular readers know of my love of soup for lunch in the cooler months. I had some potatoes that I needed to use, so I decided to make Cream of Potato soup. Wanting to “turn it up” a little bit, I decided to give it a Southwestern flair. I was really pleased with the results, and my kids liked it as well. That is always a plus! If the Chipotle Chile scares you away, don’t let it. It gives it some spice but it is not too “hot.” I think a great addition to this soup would be some diced jalapeño, which I would add at the beginning with the onion and red pepper, but that would have been too spicy for my kids. Melt butter in a large Dutch Oven over medium heat. Add the onion, red pepper, garlic, cumin and oregano. Saute for a few minutes until vegetables are soft. Add flour and continue cooking for 2 minutes. Slowly whisk in the chicken broth. Add the potatoes and bring the mixture to a simmer. Slowly add the ½ and ½ and maintain simmer. Continue simmering for about 15-20 minutes or until potatoes are tender and soup has thickened. Remove from heat and add the Chipotle Chili and the cheese, a handful at a time, stirring after each addition until melted. Season with salt and pepper and stir in the fresh cilantro. Ladle into bowls and top with desired garnish. Thanks Kate! Hope you’ll stop by again soon! 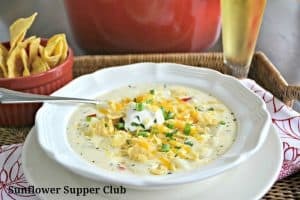 Nice twist on potato soup. Thanks Jessica! I will be over! It’s been a while since I partied with y’all over at weekend potluck, life happend. 🙂 I was over at Marsha’s and clicked on this delicious soup, so glad I did! Your picture is absolutely gorgeous! Pinning! Have a great weekend!